The RugGear RG702 is a fully featured rugged smartphone with a seriously large 4.5” IPS HD screen, and is intelligent enough to provide everything you need in a tough phone. 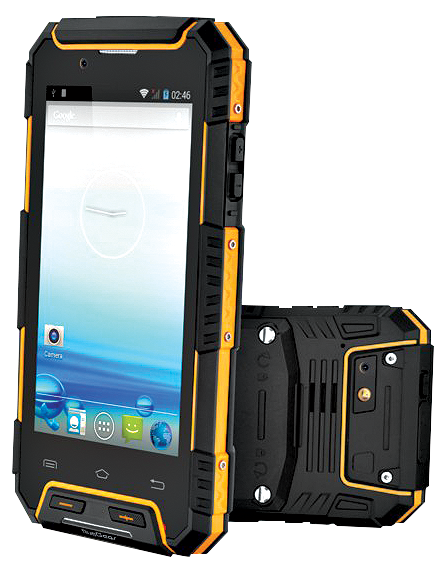 Featuring Android 4.4 (KitKat), the RugGear RG702 features an 8MP camera, Dual-SIM technology, WiFi, Bluetooth LE, GPS and is network independent. Add in a torchlight, a capacitive high bright touch screen panel that supports glove operation and a super-fast Quad Core processor, & you have yourself a highly dependable rugged smartphone that is also water & dust proof to the highest IP68 rating available. The RugGear RG702 has a MASSIVE battery life of up to 515 hours standby time, & 20 hrs talk time. Its Dual-SIM capability allows you to put both your work and private SIM card into just one device. Tested to up to 1.5metres drop test, these devices are almost indestructible. There is simply nothing tougher or smarter! The RugGear RG702: ultra intelligent and ultra tough! Work Tough and Play Smart! Get yours today! RG702 is no longer available.